This post may contain affiliate links, to find out more information, please read my disclosure statement. This Blueberry Vanilla Dairy-Free Almond Snack Bowl, made with Good Plants™ Almondmilk Probiotic Yogurt Alternative, blueberries and nutritious almonds, is sponsored by Good Plants. All thoughts and opinions are my own. Enjoy this entirely plant-based, delicious snack bowl that is vegan and naturally gluten-free. To learn more and find Good Plants by you, head here. Good Plants™ is available in select retailers only. It has officially been one month since the launch of my cookbook, and I could not be happier with the wonderful reviews, kind words and support I have gotten from everyone. 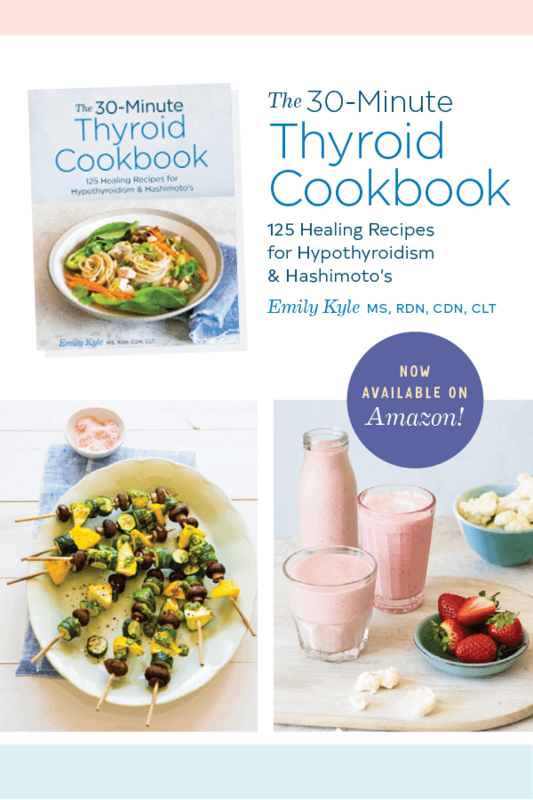 The 30-Minute Thyroid Cookbook is entirely gluten-free and dairy-free as those foods are the most common asks with those seeking diet and lifestyle modifications. I have throughly enjoyed seeing everyones’ pictures of the recipes they have made from the book, and I am always more than happy to help anyone who is looking for a product alternative while on a restrictive diet to uncover hidden food sensitivities. One question I keep getting from readers is, “what would be an alternative to traditional dairy-based yogurt“? A good question, indeed. Yogurt is a wonderful staple in so many peoples’ diets. But for those who cannot have dairy, I find it necessary to have a delicious, plant-based alternative. After trying many different plant-based yogurt alternatives on the market—soy-based, coconutmilk-based, and almondmilk-based—I have settled on a winner for both taste and texture: Good Plants™Almondmilk Probiotic Yogurt Alternative. I have tried many plant-based yogurt alternatives, and I can confidently say that the Good Plants™ has the most delicious taste and texture of the ones I’ve tried. The product tastes just like the delicious vanilla yogurt you have previously enjoyed, with a smooth texture that does not separate. For my clients following a dairy-free, plant-based, or vegan diet, this product is a wonderful option as it is dairy free and vegan certified, and for those who are interested in the origins of their food, this yogurt alternative is Non-GMO Project Verified. Made in four delicious flavors, Strawberry, Vanilla, Chocolate Coconut and Lemon Meringue, each 1 cup serving contains 100 calories, 4 grams of total sugar, and serves as an excellent source of dietary fiber with 8 grams per serving—more than 25% of the daily recommended value. Along with taste and texture, Good Plants™Almondmilk Probiotic Yogurt Alternative shines in the nutrition department as well. Compared to other almondmilk yogurt alternatives, Good Plants™contains 70% less sugar and 40% less calories while also serving up important probiotics and dietary fiber. Learn more about Good Plants™ here or check out some additional inspiration here. You can now purchase this product at select retailers, including Ahold and Wakefern. This Blueberry Vanilla Dairy-Free Almond Snack Bowl is a simple, yet delicious, dish that can come together in as little as 5 minutes. Of course, you can easily customize your yogurt bowl to include whatever toppings you enjoy. Blueberries are one of my favorite fruits because they are absolutely delicious, but they are also extremely nutritious and can play an important role in maintaining an anti-inflammatory lifestyle. There are two main types of blueberries: US highbush blueberries and low bush or “wild” blueberries. Compared to traditionally cultivated blueberries, wild blueberries have twice the amount of antioxidants per serving. Almonds are also rich in vitamin E, manganese and magnesium, as well as important nutrients like copper, vitamin B12, and phosphorous. You may have only traditionally seen lavender used for decorations and for its unique, distinctive smell, but lavender can be used for culinary purposes as well. Lavender is part of the mint family and is edible. When used in recipes, lavender can lend a delicate flavor. While the whole plant can be used for culinary purposes, the bud of the flower contains most of the sweet flavor and aroma. Vanilla Dairy-Free Almond Yogurt Bowl made with Good Plants™ Almondmilk Probiotic Yogurt Alternative, blueberries, and nutritious almonds . Add the Good Plants™ Vanilla Almondmilk Probiotic Yogurt Alternative to your favorite bowl. Top with fresh blueberries, slivered almonds, and lavender buds. Welcome! I’m Emily Kyle, a nationally recognized media registered dietitian nutritionist & holistic cannabis practitioner providing holistic health care for those living with autoimmune and inflammatory conditions. To help you, I offer food sensitivity testing, cannabis education, and this blog which provides free resources including anti-inflammatory recipes, holistic health, wellness and nutrition related articles, and evidence-based cannabis education. Please let me know how you like it, it is so, so good! I MUST try this yogurt!! !